Preparing for Kitchener Stitch. Sarah E. White, licensed to About.com, Inc.
Kitchener Stitch, also known as grafting, seems tricky until you do it a few times. It is a lot of fancy stitching that simulates knitting and purling and gives you a perfect closure for socks and other knits. It does require practice, and there is an easy way to remind yourself of the steps required. Before you can work the Kitchener Stitch, you need to set up for the technique. This requires just a few quick stitches and proper needle placement, so the process of grafting goes as smoothly as possible. To start off, cut the yarn that you've been knitting with and leave a long tail. Thread the tail onto a yarn needle. Place the needles with the stitches on them on top of each other, so that the wrong sides of the work are facing in toward each other. Slide the yarn needle through the first stitch on the front needle as if to purl. Leave the stitch on the needle and pull the yarn snug all the way through the stitch. Kitchener first steps. Sarah E. White, licensed to About.com, Inc.
Now, take the needle and slide it through the first stitch on the back needle as if to knit. Again, do not slip the stitch off the needle but pull the yarn snug all the way through the stitch. You are now ready to begin the actual grafting part. Knit off. Sarah E. White, licensed to About.com, Inc. If you have seen a knitter do Kitchener Stitch, you might have heard them mumbling. They were probably saying the Kitchener mantra: knit off, purl on, purl off, knit on. This means nothing to you now, but it will soon. 'Knit off' means that you slide the yarn needle into the first stitch on the front needle as if to knit. This time you will slip the stitch off the knitting needle and pull it tight. Purl on. Sarah E. White, licensed to About.com, Inc.
'Purl on' means that the now first stitch on the front needle is stitched next. The yarn needle goes into the stitch as if to purl, and without slipping the stitch off the needle (this explains the 'on'). Pull the yarn all the way through. Purling off the first stitch on the back. Sarah E. White, licensed to About.com, Inc.
As you might imagine by now, 'purl off' means the stitch is coming off the needle. Slide the yarn needle into the first stitch on the back needle as if to purl and slide that stitch off the needle. 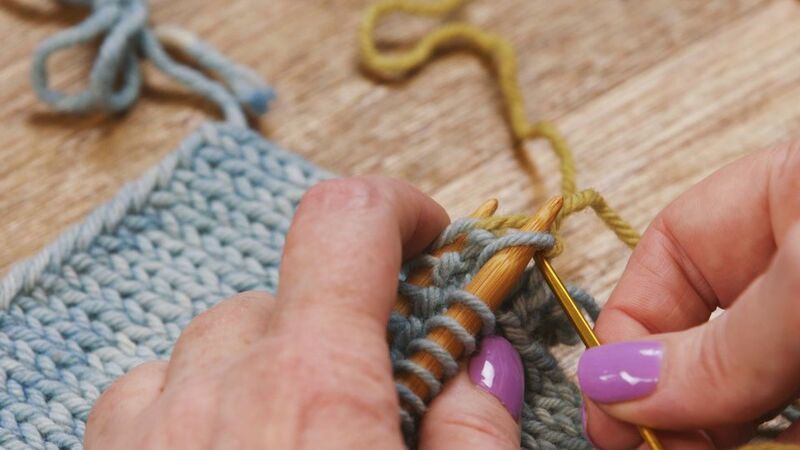 Pull tight, and you're almost done with the Kitchener Stitch process! Knitting the back stitch and leaving it on the needle. Sarah E. White, licensed to About.com, Inc. Finally, slide the yarn needle into what is now the first stitch on the back needle as if to knit, leaving the stitch on the needle. As usual, pull the yarn all the way through. The finished grafted toe of a sock. Sarah E. White, licensed to About.com, Inc. The previous steps took you through one round of Kitchener Stitch. Do the same thing (knit off, purl on, purl off, knit on) on each of the following stitches. This will get you a nice finished product that will look like a continuous piece of knitting. What Is Kitchener Stitch and Why Is It Called That?